I found The Oracle Year just a couple of days before release and the synopsis sounded so good. 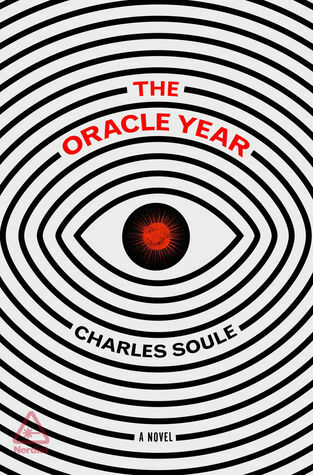 It didn’t completely deliver on what I expected it to be and that made me sad because The Oracle Year is a promising novel for this day and age. I give The Oracle Year by Charles Soule three out of five hearts because I thought it was really promising, but it just didn’t deliver on it. I loved the characters, Will and his friend Hamza. Will gets the dream in which there are 108 predictions and after one of them turns out to be true he starts giving some of them away to the people who might learn something from it. But the most important stuff he keeps for himself to sell to the too-eager companies that will spend any money to get the upper hand on others. Hamza goes along with his friend because he wants to get the best out of the hand his friend has been given. He helps Will to set things up so that he can safely show the predictions without letting anyone know who he is. The friendship is clear and interesting. I liked the dynamic between Will, Hamza and Hamza’s wife. I found the writing was great, it was just that the overall plot of the novel lacked severely. It felt like one of those plots that has already been used and not just drawn inspiration from. Together with a slow pace, annoyed me. I couldn’t figure out whether the novel spanned a month or a year. Like I said before, the story sounded interesting, the characters were great. But it just doesn’t deliver. This entry was posted in Book Review and tagged Adventure, Book Review, Charles Soule, Drama, Mystery, Science-Fiction. Bookmark the permalink.